Nakul Saxena is a Fellow at iSPIRT. With only a few days to go for the Make In India week, the Department of Industrial Policy & Promotion (DIPP) is set to announce a Rs 2 crore bounty along with Qualcomm. During the Make in India Week being held in Mumbai, the DIPP and Qualcomm Incorporated, through its venture investment arm, Qualcomm Ventures, have announced India’s largest Startup prize till date will see the winner walk away with US $ 350,000 in equity funding. To submit your entry, download the application form here, fill your startup details and email it to [email protected], for further information please click here. Start-ups can submit their entries on the DIPP / Make in India website. The grand finale will be held at the Make in India Centre, MMRDA Grounds, Bandra – Kurla Complex and will be televised nationally. Winners can look forward to a large dollop of publicity, glory and much more, thanks to the hundreds of CEOs and founders of top Start-ups from across the country that are attending the Make in India Week. A ‘startup’ is a company that is confused about – 1. What its product is, 2. Who are its customers, 3. How to make money. As a startup we all struggle either with the Market Fit, the right price for the product and finally the sales. There have been times when we have wondered if the product is perfect or I could have added some new feature, all the while loosing time to launch the product. When the product is out we wrestle with how to sell – Free, Premium or Freemium models and wonder, when will we get to close the big orders. We wonder why our product is being outsold by our competition – What does he have that I don’t. We sometime wish that how wonderful it could be if we could share our thoughts, bounce our ideas with someone who could understand us and help us in a sustained long term manner, in short become our Guiding Lights as Mentors. To help startups with just this dilemma, we are pleased to partner with CIO’s of leading Indian Enterprises to put together the CIO Mentorship Program. Where some of the very recognized CIO’s of the Industry from Hero Motors, BMW, Ericsson, Matrix, Max NewYork Life, Moser Baer are ready to use their collective wisdom and experiences to help the startups scale over a sustained time period of 5 months. If you are brilliant Enterprise Product who is willing to take advice, implement advice and share your pain points then this is just the opportunity. So if you are operating in HR, Education, Data Analytics, Cloud, Mobile applications, CRM’s then you need to apply here. This is only open as of now for companies in NCR region. The last date of getting the entries is 17th Dec. Only the short listed companies will be contacted for the event on 21st Dec in Delhi NCR. It was a usual Thursday morning, chaos at the Mathura Road, but once you got on to the 91SpringBoard office, you could feel the aroma of the paints, etc in the new office which is beautifully done and very colourful. Few guys were sipping their early morning coffee and some interactions by entrepreneurs and some folks who usually give gyaan to them:). Few minutes and you could see the geeks walking in, interacting the dilliwallas and then also trying to figure out a space where they can settle down. Yatin from MoonLighting kicked of the session and the Geeks introduced themselves to the #dilliwallas. We had around 50-60 startups from dilli who were here to meet with the Geeks….some of the best startups in NCR were present and we had the Bangalore Product guy – Sharad Sharma who was there to set the ball rolling. He started his talk on how entrepreneurship is happening in the small cities of rural India, software products are being made in this New India. Delhi, Mumbai and Bangalore are seeming to be focusing on fixed templates, whereas the rural India’s innovation are more creative disruptions and they seem to be focusing on problems and therefore providing solutions to these problems. The guys in the smaller cities and rural areas are keeping a more open mind and are more willing to weather the storm and be persistent with product. Dave from 500 Startups takes centre stage and describes what they do by making a lot of small investments in tune of about $ 1-5 Million. The aim is not to own more than the 5% of the bigger companies. They know most companies may not see the entire life cycle therefore they do their do diligence well and invest quickly. The First tranch is the huge risk but the future investments are based on what they do with that money. Engaging with Communities of specialists in design, data and distribution which act as Elders or Mentors to these companies help them grow. Usually the Distribution / Marketing aspect is the main factor which helps companies being successful. Concepts of Marketing have changed dramatically compared to change in programming in the last 20 years. Therefore it is important to get the Marketing right. Entrepreneurs need to focus more on Marketing than on the programming. It is very important need to know the customer acquisition cost vis-visa-vie customer revenue being generated and the cost of financing the project for how long. Concentrate on the Indian Market, it will be easier to do business in an environment which you know of rather than a new international market of which you don’t know anything of. Things may not be that settled yet, but it will be in the next 3-5 yrs. Imagine if you are able to build now focusing on India and by the time support services improve, payment channels ease say in the next 3-5 years you as an entrepreneur will be able to go in for the kill. The Fruit will be ripe for plucking. Message : Look Inward and build slowly. Wait for the Time its just round the corner. The Stage was set after two very insigntful speeches about what is yet to come. Kunal Bajaj then lead a B2B Space Panel Discussion with Ambarish Gupta from Knowlarity, Ketan Kapur of Mettl and Paras Chopra from Wingify 1) How do you find the right person? Panel: The team was brought together through references and own networks. 2) How do you market to customers? Panel – Start early, Be Focused and be Disciplined. 3) How have you raised funds and raised capital? Panel – Raising debt in US much easier than in India. In India the process is Angel Money. But is important to know what your burn money is MOM enabling you pitch it right and get it. Kunal then lead B2C Space Panel Discussion with Aloke from Ixigo, Kavin Mittal from HIKE Mobile app, Rajat from SocialAppsHQ. How do you find the right people and keep them engaged? Panel – The Challenge is to make people understand what a startup is. The Initial hiring was done through references and interactions through likeminded people. How do you market to customers and build Brands? Panel – Give swops on getting referrals to new clients. Understand your market clearly and go micro and specific. How have you raised funds and raised capital? Panel – Raising debt and funds in US much easier than in India. In India to raise funds traction in business is very important. By the time the Panel finished answering the questions there was a group of over 55-60 people eagerly waiting to interact with them and the Geeks. Today there are proven automation tools in the market from HP, IBM as well as open source tools like Selenium, Webdriver but the success does not lies in just investing in to tools but putting right strategies, best practices in place. Qualitia is a one of its kind platform which intern leverages these tools as an execution engine while enabling users to adopt RIGHT strategies, best practices, where in now test automation designing, test automation development and even detailed reporting happens in Qualitia. We interviewed Rahul Chaudhari(MD & CEO) & Sudhir Patil(Founder Director) about the company’s product development journey & their advice for startups. Q) What was the Vision with which you launched the company ? Vision is to empower the manual test engineers to contribute to test automation worldwide. Which has been a job of the technology resources till today, but we see a larger opportunity to empower the 90-92% of the QA community who come from the domain background or functional knowledge background and empowering them to drive test automation way faster then any traditional way of automation. Test automation challenges are primarily attracting resources who were good in development technologies and then making them work into testing. Bridging the gap between domain and technology expertise to dramatically reduce the turnover time in test automation. This will empower the SME’s manual test engineers that are the existing strength of every company to drive automation themselves. Also to reduce the maintenance effort and cost of enterprises to help them to invest into test automation. Q) How will the product help startups to scale up? The competencies required to drive test automation. The Cost of commercial licenses. We therefore provide the solutions through Qualitia where startups can get the licenses on subscription model at around 23% of cost of their QA resource with 200% increase in the productivity leading to huge savings for a Startup from day one. Q) Which are the important markets which you are looking at? India contributes the maximum of users, where as US contributes 60% to the buying space worldwide. Therefore a balance needs to be created between them therefore both are important markets for us. Q) What is the next 1 year roadmap for the company? by customers there. The target is to grow the revenues in double digits. Q) What advice would you give to new startups? 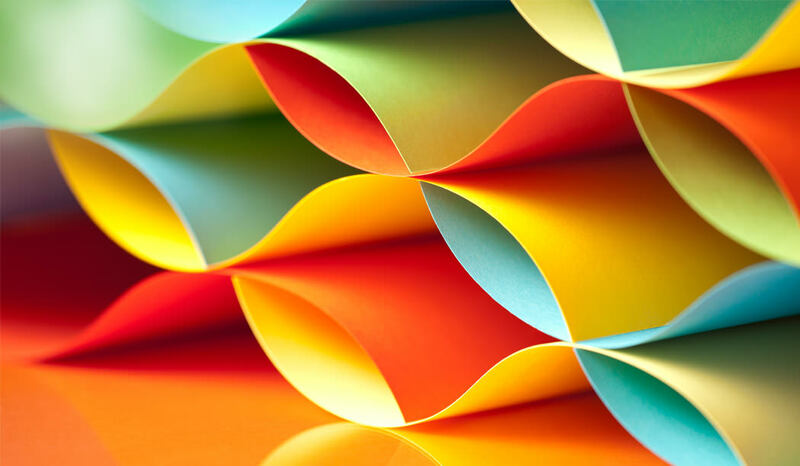 For any product – The idea and its research is important keeping in mind ability to take the product to the market. Time is of the essence. Therefore it is very important to ensure that the fructification of the product on real time is very important. Q) What has been your go to market strategy? Identifying the focus clearly, and slowly expanding the market. 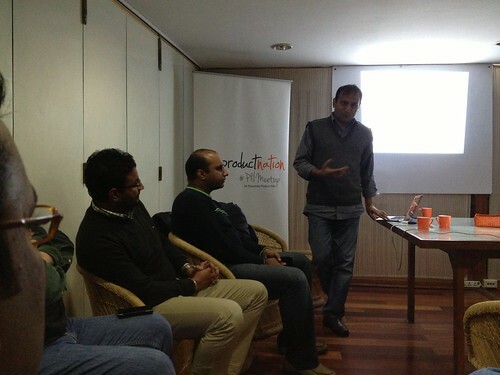 #PNMeetup on Selling your product Gangnam Style was the topic at the recently concluded Meetup(Podcast link). We had over 45-50 people across products and the services who came out to gain an insight into the Enigma of Gangnam Style Sales, with their eyes wide open and all ears the speakers Mr. Sanjay Agarwala MD of Eastern Software, Ketan Kapoor Co-Founder and CEO of Mettl and Vishal Jain Chief Product Officer of RateGain gave an eagles eye clarity of how one could reach the summit of the Gangnam Style Sales. Sanjay set the tone of the session by sharing his experiences of Eastern Software system which he started in 1991 and where he saw an opportunity in the product space in 1997 and ventured therein. The company dived headlong into ERP where there was a huge demand in the small and midcap segment. The larger players were serviced by prominent players. They clearer pegged themselves below these big players. The positioning was very clear to all parties concerned form the beginning. Because of their positing they got Pvt Equity Investments which enabled them to concentrate on Product development and Market Development which helped them scale to 100 customers in 2 years and 800 customers by 2001-2002. They looked for newer markets outside and concentrated on newer markets. Africa was a huge virgin market, every body was skeptical but it was an immense market waiting to be tapped. They tweaked their sales model from a direct Sales(applicable in India) to partnering with the local companies(In Africa), they believe when you partner with anyone the relationship has to be a win-win. The partners should benefit first and then you. That builds trust which is further solidified when you match your own money with the amount the partner spent, sending clear signals to all. Since the partner operates in the market and is now highly motivated he is able to better understand the changing environment and this helps in better customer deliver. 4) Most importantly Build Trust and Partner well. The baton now passed from to Sanjay to Ketan CEO Mettl. Ketan gives a very good insight into Mettl and sets the stage. Ketan believes that business is like a marathon but one must run it like a sprint. Therefore must Start selling Early- even before the product comes out enabling you to get the information to all. Prioritize – Initially launch the product on what you feel–then tweak it to evolve the actual needs. Use Analytics to identify differentiators and then set benchmarks. Focus on Closures but budget for long sales cycles – have enough gas in the fuel tank. Always treat your feedback seriously this helps you to better customer delivery. Build your brand well – Build Trust – Hire the Best – Hire slow. Clearly specify the product mix therefore maintain the Brand. Interestingly Ketan remarked that Introverts can be better sellers than extroverts- Why? Well the key is to establish strong personal connects, be clear and not over-commit. Qualities where Introverts can be better sellers. Ketan’s Gangnam style for Mettl. 5) Have the Bear Fat to sustain theWinter. 6) Most importantly Build Trust. Listen to the audio podcast here of Ketan’s talk. Ketan gave a wonderful insight of his company and then Vishal of Rategain share his story. Vishal says that before they launched their products they started writing articles on the subject/space of their product and this helped them to get the first order by engaging their customers and peaking their interest. This helped them to partner with their biggest competitor and thus tap their(competitor’s) home market – Spain first. Vishal believes the speed to market is very essential to launch your products fast. When you sometimes target the weakness of your competition new opportunities open up. They were able to get 300 hotels to sign up in a just a matter of 3 month. This helped them to partner the competition to market their products. This also had a problem, the local hotels did not know RateGain but knew their competitor. Team Rate Gain then made a real effort to delink themselves and market the product directly this ensured that their Brand was known. They invested in it to Build the Brand. Since they have operated in various developed markets some things which work for them are Webinar sales – where they invite their prospective clients to join in and make their own mind. From Customers becoming advocates for them on Linkedin to localizing their business to peer marketing, all have worked to create huge amount of word of mouth and Brand Awareness which have all helped in Sales. 8) All Chain Stakeholders need to be targeted. The Various inputs helped in gaining a wonderful insight into how a company could go Gangnam. Hope I have been able to capture every bit of information hear, an hope if you have attended the sessions you will be able to add your takeaways too. The Wonderful insight shared will certainly help all the entrepreneurs out there and for this Avinash deserves huge credit in ensuring that latest trends are captured. 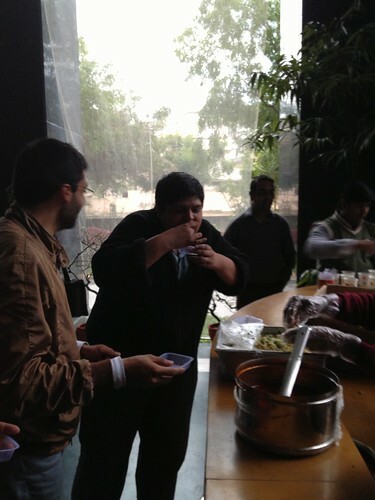 Also Rajat for very aptly naming the theme Gangnam style. Look forward to seeing you all at the next edition in Feb….